The United Mexican States (Mexico), a republic approximately three times the size of Texas, contains a population estimated in 2001 at about 101.9 million, growing at 1.9% per year. Mexico is the United States' immediate neighbor to the south, sharing a 2,000 mile border. Mexico is also bordered by the Gulf of Mexico to the east, the Pacific Ocean to the west, and Guatemala and Belize to the south. There are 31 states ('estados') in Mexico, plus the autonomous federal district; these administrative regions are shown in Figure 1. The capital, Mexico City, with a population of about 15 million, is the most populous city in the world, and is located in the south central part of the country. Mexico's unit of currency is the peso, which exchanges at about 10.2 pesos per U.S. dollar (1 peso = $0.098) as of October 2002. The Gross Domestic Product (GDP) of Mexico in 2001 was estimated at $516 billion and is expected to grow by 2% in 2002 3.5% in 2003. Mexico signed the North American Free Trade Agreement (NAFTA) in 1994, and is also a member of the Organization for Economic Cooperation and Development (OECD), the Asia-Pacific Economic Cooperation forum (APEC), and the World Trade Organization (WTO). State ownership of energy assets is an historically significant characteristic of Mexico's economy. The most important national entities in energy are the state-owned oil and gas company, Petroleos Mexicanos (PEMEX), and the national electricity utility, Comisión Federal de Electricidad (CFE). Control over Mexico's huge energy sector is presently concentrated under the offices of the Ministry of Energy. The two-year-old administration of Mexican President Vicente Fox has not yet succeeded in implementing promised free market reforms in the energy sector. The centerpiece of these planned reforms would be the privatization of PEMEX. Some of his proposed changes would require amending Mexico's Constitution, necessitating a two-thirds majority vote in Congress where the Fox pro-reform National Action Party (PAN) faces stiff opposition. In the meantime, the Fox Administration is working on other ways to attract much needed foreign investment capital to finance hydrocarbons drilling, production, and electricity infrastructure improvements. A potential step in this direction occurred in May 2002, when the leader of the opposition PRI party, Roberto Madrazo, came out in favor of selling a percentage of PEMEX and CFE through a stock offering, with the funds to be invested in infrastructure. The Fox Administration released its 2001-2006 National Energy Plan in late 2001 calling for $120 billion in energy sector investments and a much greater role for the private sector. Recommendations include reforms in energy regulation to allow private companies to operate in exploration and production of natural gas and oil refining. The Plan recognizes the need for substantial investments in energy infrastructure to keep up with rapid growth in demand: $48 billion for oil and gas upstream activities; $34 billion for the electricity subsector; $20 billion for natural gas; and $18 billion for refineries. The Fox Administration also wants to see a more involved private sector in energy in Mexico, and would like to implement the following: permit PEMEX to reinvest in capital projects; open up PEMEX's service stations to offer non-PEMEX brands of motor oil; permit foreign companies to distribute liquefied petroleum gas (LPG) at the retail level; improve the transparency of regulations for investing in liquefied natural gas (LNG) projects; allow independent power producers to sell directly to end-users any power not bought by CFE; and invite hydrocarbons companies to bid on dry natural gas development projects. Mexico's energy policy stresses expanding the natural gas market and reducing reliance on fuel oil; it is now Mexico's stated intention to change over to natural gas as its primary fuel for the future. The Secretary of Energy has initiated an Integral Fuel Policy, which seeks to significantly reduce the use of fuel oil within 10 years. The policy has four main components: (1) the construction of new natural gas-fired combined-cycle power plants; (2) the conversion of several power plants from fuel oil to natural gas operation; (3) an increase in the industrial use of natural gas to meet resulting new environmental standards implemented in 1998; and (4) the promotion of industrial and domestic use of natural gas. Legislation enacted during 1995 opened natural gas transportation, storage, and distribution to private (including foreign) investment and allows private companies to import and export natural gas. PEMEX, which prior to 1995 controlled all of the country's gas industry, maintains control over the gas upstream sector under this law, with midstream and downstream segments now completely open to the private sector, provided the companies are not involved in more than one function. Companies are awarded 30-year licenses through competitive bids. The Law also loosened import and export controls on companies and established regulations for distribution infrastructure. The natural gas industry in Mexico is now the least regulated of Mexico's energy subsectors. Mexico's Energy Regulatory Commission (CRE) oversees the natural gas industry, and under the 1995 law, CRE is mandated to achieve a competitive, efficient, safe, and sustainable natural gas industry as part of Mexico's efforts at increasing use of natural gas for environmental, economic, and other reasons. CRE's powers include enforcement of regulations, inspections of facilities, issuance of permits, regulation of prices, and overall supervision of the industry. Diversification of Mexico's electric power industry has also taken place on a limited basis. Private investors may now participate in power generation, but the transmission and distribution of electricity is still reserved for the public sector. By constitutional mandate, the Mexican government has direct, permanent, and nontransferable dominion over the electricity distribution and transmission to public users. Mexico has abundant reserves of petroleum and natural gas, yet strong economic growth is causing energy demand to outpace the country's ability to generate additional supply. A lack of infrastructure forces Mexico to flare significant amounts of natural gas while, until recently, inadequate investment in exploration and production has hampered production. Limited refinery capacity means Mexico must import nearly one-quarter of its gasoline. Budgetary constraints on major infrastructure projects like natural gas pipelines, transmission lines, and power plants prevent electricity-generating capacity from keeping up with electricity consumption. Blackouts are predicted as early as 2004 if improvements are not made. The country is a net natural gas importer from the United States and will be through 2015, given that most of Mexico's natural gas production is in the south, where inadequate infrastructure hinders transport of the gas to northern growth centers. The concept of integrating the energy markets of Mexico, the United States, and Canada is gaining popularity. Numerous pipelines and transmission lines already connect the United States and Canada, though few span the U.S.-Mexico border. Companies are building power plants in northern Mexico to generate electricity to satisfy rapid demand growth from industrial and residential users. Given Mexico's less burdensome environmental regulations relative to those of California, it is possible that more power plants will be planned for northern Mexico to help satisfy the energy needs of both northern Mexico and southern California. While greater integration of the United States and Mexico is progressing, Mexico should not be seen as a solution to future supply shortfalls of electricity in U.S. markets, such as what happened in California in 2001, certainly not for the short- to mid-term. Mexico is a net energy exporter; the difference between its energy production and consumption is mainly crude oil exports. Energy consumption by 2010 is estimated to increase to approximately 9.0 Quads, at an average rate of increase of 2.8% per year. An historical summary of Mexico's Total Primary Energy Production (TPEP) and Consumption (TPEC) is shown in Table 1. Mexico produces three grades of crude oil: heavy Maya-22 (which accounts for more than half of total production); light, low-sulfur Isthmus-34 (about 28% of production); and extra-light Olmeca-39 (about 20% of production). Mexico controls the second largest proven oil reserves (30.8 billion barrels at the beginning of 2002, down from 32.6 billion barrels one year earlier) in the Western Hemisphere, with only Venezuela ranking higher. Mexico stands ninth in the worldwide ranking of proven oil reserves. About one-fourth of Mexico's total oil reserves lie in the Chicontepec region of Veracruz estado, and are as yet uneconomical for PEMEX to develop. Analysts believe independent producers might be able to profitably develop Chicontepec, but Mexico's constitution bars them from doing so. To get around this legal barrier, PEMEX has announced plans for the introduction of multiple service contracts in hydrocarbons exploration whose total value could reach $8 billion; bidding could begin in the fall of 2002. PEMEX has already signed a multiple service contract with Japan National Oil Corporation (JNOC) covering a two-year feasibility study into joint exploration of the Chicontepec basin. Each firm will invest nearly $3 million and the study will be completed in December 2003. The basin holds what is believed to be one of the largest reserves in the world, up to 70 million barrels, but exploration is not yet feasible given the limits of current technology. Three-quarters of Mexico's oil now comes from offshore sites in the Campeche Bay in the Gulf of Mexico. The country's largest oil field is the Cantarell field in the southern part of Campeche Bay, contributing 2.3 million barrels per day (b/d) of Mexico's total crude oil production. The most productive onshore field is the Samaria field in Southern Mexico, which in 1996 yielded an average of 76,215 b/d of 29.3O (API) crude. Production from oil fields in the south of the country generally exceeds those in the north. Mexico's current oil development efforts focus mainly on the $10.5 billion Cantarell field, whose output increased 60% between 1994 and 2000. The introduction of nitrogen injection at the Cantarell field, which is improving the field's productivity, began in August 2000, seven months ahead of schedule. Nitrogen injection is intended to raise reservoir pressure and increase the average per well production of heavy Mayan crude, which has fallen from about 35,000 b/d in the 1970s to about 1,400 b/d today. A group that includes BOC Gases, Marubeni, Linde, Westcoast Energy, and ICA-Fluor Daniel built a $1 billion nitrogen plant, consisting of four 300 million cubic feet per day (MMcf/d) units (each of which individually would be the largest such operation in the world), which will supply Cantarell with 1.2 billion cubic feet per day (bcf/d) of nitrogen. The supply contract runs 15 years and is worth $2.7 billion. The nitrogen injection project will enable PEMEX to retrieve an additional 2.3 billion barrels of oil from Cantarell. In June 2000, Mexico and the United States reached agreement to divide out a four million acre area of oil on the outer continental shelf in the Gulf of Mexico, which lies between the two countries 200-mile Exclusive Economic Zone in the oil-rich western Gulf of Mexico. The agreement grants Mexico 62% of the area and the United States 38%. Although the depth of the water is 10,000 feet, with advances in deepwater drilling the area has generated considerable interest. Other new Mexican oil development projects include the heavy-crude Ku-Maloob-Zaap complex in the offshore Campeche basin, and the Grijalva Delta light oil project. Mexico is the world's fifth-ranked oil exporting nation, and Mexico's oil industry is a major source (about 37%) of government revenue. Total Mexican exports were 1.5 million barrels per day (b/d) and earned the state treasury $10.4 billion in 2000. Mexico presently ranks seventh in the world in crude oil production, and as a major oil producer, often sets oil prices and production targets in line with those of the Organization of Petroleum Exporting Countries (OPEC). Under the current agreement between Mexico, OPEC, and the other independent producers in place in the first half of 2002, Mexico's export levels are capped at 1.6 million b/d. Mexico is sensitive to the delicate nature of striking a balance in world oil prices. Higher oil prices help export earnings, yet jeopardize domestic industry and the economy of the United States, Mexico's largest trading partner. Mexico is the second-largest supplier of crude oil to the United States, behind Saudi Arabia. In the first half of 2002, Mexico exported 1.446 million b/d to the United States, equivalent to about 16% of U.S. total crude oil imports. Spain, Netherlands Antilles, and Japan are other oil export markets for Mexico. PEMEX is the world's sixth largest oil company, and the single most important entity in the Mexican economy. In early 2000, PEMEX was capable of producing 3.3 million b/d, or about 4% of world production. PEMEX enjoys widespread popular support as it embodies Mexican independence and sovereignty. PEMEX has a monopoly over exploration and production (E&P) of all hydrocarbons, a position guaranteed by Article 27 of Mexico's Constitution which reserves ownership of hydrocarbon resources to the state; foreign participation in the upstream sector is limited to service and performance contract arrangements and turnkey drilling contracts. PEMEX was successful in lobbying the legislature for a 40% raise in its investment budget, after years of underfunding, to $14.7 billion in 2002, with $10.5 billion going for exploration and production. The 2002 funding level compares with an average of $4 billion per year for much of the last decade and $6.5 billion between 1996 and 2001. Significant recent investments in exploration and production by PEMEX have begun to pay off, and oil production has begun to pick up after suffering several years of declines. PEMEX hopes to produce 3.268 million b/d in 2002, up 4.5% from 3.127 million b/d in 2001 (which was its highest production year ever). New drilling in 2001 was up 60% over 2000, to 446 wells. This total represents more than the total drilled between 1996-98. The success rate for exploration wells was 51% and that for development wells was 91%. PEMEX wants to boost hydrocarbon production even further, hoping by 2006 to increase crude oil production by 30% and natural gas production by 50%. However, PEMEX believes that Mexico's crude oil exports could drop by as much as one-third over the next half-decade unless private investment increases in the areas of production and exploration. Mexican oil production has switched to a heavier concentration of heavy crude over the last several years. In 2001, 59% of PEMEX's output was heavy crude, almost all from the Cantarell field, up from 48% in 1997. Similarly, heavy crude as a percentage of exports has risen from 56% in 1997 to 69% in 2001. The shift in Mexico's crude output to a greater concentration of heavier crude suggests PEMEX has benefited from its investment in Cantarell, while production at Mexico's other fields have declined -- production at the offshore Abkatun field, for example, has fallen from 330,000 b/d of crude in 1993 to 108,000 b/d in 2001. An historical summary of petroleum production and consumption in Mexico is shown in Table 2. PEMEX currently has six refineries with a distillation capacity of approximately 1.56 million b/d, but has a growing shortage of refinery capacity. PEMEX has committed $5.8 billion through 2004 to modernize these six refineries, and anticipates increasing capacity by another 690,000 b/d. As a result of improvements, PEMEX expects to increase its refinery production by 14% in 2002. A summary of Mexico's petroleum refineries is shown in Table 3. The Cadereyta refinery,which serves Northern Mexico, including Monterrey, is the first of PEMEX's refineries to be modernized. This $2.4 billion project is now essentially complete, except for an unfinished coker that is preventing the plant from operating at full capacity. The upgrades sharply increased the refinery's capacity to produce jet fuel, diesel, and gasoline and added 40,000 b/d in capacity, bringing Cadereyta's total capacity to 275,000 b/d. LPG production from the refinery is also expected to increase, from 1,900 b/d to 7,800 b/d, as a result of the upgrade. PEMEX initiated the project in 1997 when it signed a contract with South Korea's Sunkyong Engineering and Construction, Germany's Siemens AG, and Mexico's Grupo Tribasa for the upgrading work. Those companies have now completed their projects, but the work on the coker went out under a different contract to the Mexican construction companies Protexa, and then Tribasa, which were unable to complete their work. Whether PEMEX will offer the project for tender or directly assign the work is unclear. A contract covering a $1.6 billion modernization of the Ciudad Madero refinery was awarded in 1999 to the same Sunkyong Engineering and Construction-led consortium that just finished work at the Cadereyta refinery. The Ciudad Madero refinery is located in the Tamaulipas estado and serves the Gulf Coast and central regions. The modernization includes a facility for hydro-treatment to reduce the sulfur levels of gasoline. The work will enable the production of sulfur, hydrogen, gasoline and naphtha, among other fuels. Work is scheduled to be completed by the end of 2002. Contracts worth $155 million were awarded (although eventually cutback) for upgrades to the Tula refinery and $110 million for the Salamanca refinery, both going to Samsung Engineering. The Tula refinery serves Mexico City and central Mexico, while output from the Salamanca refinery goes to western and central Mexico. Salamanca is also the center for lubricant production. Both the Tula and Salamanca refinery upgrades had been scheduled for completion in 2002. PEMEX has announced plans to collect bids in August 2002 to refurbish and modernize the Minatitlan refinery, Mexico's oldest, serving the south and the Yucatan Peninsula. No dollar figures for the Minatitlan upgrade were given; the plan gives precedence to local companies. In July 1999, Fluor Daniel, together with Mexico's ICA won a $211 million construction contract for five sulfur plants at the Minatitlan refinery. But just six months later the government announced it would likely freeze its improvement plans for Minatitlan. The Salina Cruz refinery, located on the southern Pacific coast, is the country's largest refinery. Plans to modernize this refinery have been postponed. Mexico's growing needs will not be satisfied by PEMEX's modernization program alone. The Mexican Energy Ministry has stated the country needs to invest another $19 billion by 2007 to upgrade its refineries. Officials at the Energy Ministry have stated that PEMEX will need to build two or three new refineries by 2010, in addition to modernization efforts at its six existing plants, to meet heightened demand for gasoline and refined products. Capacity at each new facility would need to be 150,000 b/d; such refineries would likely cost about $2.7 billion each. PEMEX has budgeted only $7 billion over the next five years on all of its refining activities, including capital improvements and all day-to-day operations. PEMEX maintains a monopoly and control over refining of crude oil and production of eight basic petrochemicals (butane, carbon black feedstocks, ethane, heptane, hexane, naphtha, pentane, and propane). An historical summary of Mexico's refined petroleum product output is shown in Table 4. Due to its refinery capacity shortage, Mexico now imports close to one-fourth of its gasoline and diesel fuel. In 1999, domestic demand for gasoline was 512,000 b/d and 270,000 b/d for diesel. Due to projections of strong economic growth in Mexico, domestic gasoline demand is forecast to reach 808,000 b/d by 2010, while demand for diesel fuel is predicted to climb to 460,000 b/d. An important foreign source of gasoline (up to 45,000 b/d) for Mexico is the 255,700 b/d Deer Park (Texas) refinery, a $1 billion per year joint venture between PEMEX and Shell Oil Company of the United States. PEMEX began investing in the refinery in 1993. In 2001, a modernization of the Deer Park facility was completed that has, among other things, raised output by about 60,000 b/d and enabled it to process 220,000 b/d of heavy Mayan crude. PEMEX has also signed a long-term deal with Clark USA in March 1998 to supply Clark's Port Arthur, Texas refinery. Clark is approaching completion of a coking unit that will enable the facility to process 200,000 b/d of Mayan crude. PEMEX is forecasting 2-3% annual growth in demand for refined products through 2010 and it needs to increase refinery capacity 14% over that period to keep pace. Despite PEMEX's efforts to boost refinery capacity, Mexico imports 380,000 b/d of refined products. Imports of refined products have cost Mexico $7.6 billion over the past five years, and will cost another $7 billion over the next five years. An historical summary of Mexican exports and imports of selected petroleum products is shown in Table 5.
note: quantity of "0" (underlined) actually means "less than 500 b/d"
Mexico's secondary petrochemical plants produce 13 types of petrochemicals at 61 plants located mainly in 10 complexes throughout the country. The largest plants are Cactus, Casoleacaque, La Cangrejera, Morelos, and Nuevo PEMEX, while Pajaritos, Poza Rico, and Reynosa are sites of smaller gas processing plants. The Mexican government is actively encouraging investment in the chemical and petrochemical industries, stressing the importance of these value-added products to the national economy. Proven reserves of natural gas in Mexico presently stand at 30.1 trillion cubic feet (tcf), ranking Mexico 21st in the world. Total recoverable reserves are estimated at 50 tcf with the potential to economically recover another 50 tcf over the next several decades. Until relatively recently, Mexico had not given high priority to the development and use of its natural gas reserves. A major constraint has been the lack of investment in pipeline infrastructure for transporting gas over long distances. Most of Mexico's natural gas is produced in the southeastern part of the country, far from the major consuming areas in the north and northeast. Associated ("wet") gas (i.e., gas produced along with crude oil) is produced both onshore (primarily in the southern Chiapas and Tabasco regions) and offshore. Natural gas also is produced in the northeastern part of the country at the country's largest non-associated ("dry") gas field, Burgos. The Burgos basin has been in production since 1945, with maximum production of more than 600 million cubic feet per day (MMcf/d) reached in 1970. PEMEX hopes to increase Burgos production through 3-D seismic technology combined with new drilling techniques and hydraulic fracturing; the first major contract ($110 million) for this work went to Schlumberger. PEMEX plans to spend $5.5 billion by 2015 on these and other efforts at Burgos. According to a study performed by the Gas Technology Institute, these investments are expected to yield significant increases in production of non-associated gas over the next 20 years. With increased trans-border shipment of natural gas between the United States and Mexico expected in the future, the substantial additional output from Burgos could have a sizable impact on the U.S. natural gas market. PEMEX has also been investing heavily in exploration and is drilling for more non-associated gas. The extra drilling has been able to shore up gas production, but what is needed is a significant increase in output. Recent discoveries of non-associated gas hold promise for improving Mexico's supply outlook, namely a major discovery in the Lankahuasa gas field in Veracruz estado, the offshore Playuela field, and the Hap field in the Sound of Campeche. Potential reserves from these three fields equates to a quarter of Mexico's proven reserves of natural gas. Natural gas demand is climbing rapidly in Mexico, due to greater reliance on gas-fired power generation and privatization of natural gas distribution systems in the nation's largest cities. PEMEX is forecasting a doubling of natural gas demand to almost 9 bcf/d from the current 4.3 bcf/d by 2010. PEMEX itself will become a much larger consumer of natural gas as new combined cycle power plants are built and existing ones are converted to natural gas. Industrial development along the Pacific Coast from Puerto Vallerta to Acapulco will also create more demand for natural gas. While demand is forecast to achieve rapid growth over the next decade, production, on the other hand, is failing to keep pace. Even with an ambitious development program and the expectation that gas production will increase by an average of about 9% annually through 2010, Mexico will still only be able to supply about 80% of its growing domestic needs by 2010. According to Mexico's Secretary of Energy, the electricity sector accounted for about 29% of total natural gas consumption in Mexico in 2001, and this is expected to increase to about 36% by 2006. In 2001, the electricity sector in Mexico consumed about 1,358 MMcf/d of natural gas, while in 2006, the electricity sector's natural gas consumption is projected to be about 2,791 MMcf/d. An historical summary of natural gas production and consumption in Mexico is shown in Table 6. Mexico has historically relied on natural gas imports from the United States; in 2001, 10% of Mexico's demand was met through U.S. gas imports. U.S. gas comes from Texas and the Gulf of Mexico, both largely mature markets that are struggling to accommodate demand growth in the U.S. market. The Mexican Energy Ministry forecasts that by 2010, imports will cover 19% of national requirements, with domestic supply falling short of demand by 1.87 bcf/d. Mexico is expected to be a net gas importer through 2015. Opponents of a more open energy sector believe government estimates of future demand are inflated as a means of justifying the need for private sector foreign involvement in hydrocarbon exploration and production. Natural gas imports climbed through the second half of 2001, reaching 463 MMcf/d in September. Import volumes have remained strong in 2002, averaging 326 MMcf/d in January and 292 MMcf/d in February. PEMEX is forecasting 2002 import levels to be 130% higher than in 2001, climbing from 292 MMcf/d to 673 MMcf/d when imports from the massive North Baja pipeline comes online in the Fall of 2002. Rapidly growing demand from the electricity subsector for natural gas has spurred greater interest in liquefied natural gas (LNG). Mexico is expected to aggressively develop LNG facilities to meet demand, but large costs involved have so far kept any projects from breaking ground; if Mexico does go ahead with LNG, it is unknown how many projects will advance. Commercial interests want to place the regasification infrastructure near Altamira on the Gulf of Mexico or Ensenada in Baja California, both of which having the advantage of being close to large Mexican markets and the southwestern United States where there is already pipeline infrastructure in place. The Mexican government is also interested in sites for LNG import terminals along the Pacific Coast of central Mexico, with potential sites including Topolobamba, Manzanillo, and Lazaro Cardenas, which could all serve as access points for Guadalajara and the surrounding industrial areas. Manzanillo and Lazaro Cardenas also have the advantage of relative proximity to Mexico City while Lazaro Cardenas is already connected to a pipeline. A joint venture of Sempra and CMS Energy is pursuing plans to construct a LNG terminal 15 miles north of Ensenada, in Baja California estado, and have it operating by 2005. The companies are proposing construction of a 40-mile pipeline connecting the regasification plant to the North Baja pipeline. The list of companies that are interested in Mexico's LNG market and are supporting different projects also includes Shell, Marathon, a joint venture between El Paso and Phillips, ChevronTexaco, and a joint venture between BP and Williams. Shell, Marathon, ChevronTexaco, and the El Paso-Phillips joint venture are discussing importing LNG from Australia and Indonesia, while Sempra-CMS wants to bring in gas from Bolivia. Shell is presently considering an investment of $500 million for a LNG regasification terminal in Baja California, which would have a capacity of 1.3 bcf/d. The project, which is still in the feasibility study stage, would include a distribution pipeline; the gas would be sold to local industries and power plants and any surplus gas would be exported to the United States. Shell has reportedly already contracted for 7.5 million metric tons per year of LNG from sources in the southern Pacific region. European companies are presently the most active foreign investors in the natural gas sector, led by Spain's Gas Natural and Belgium's Tractebel Electricity and Gas International. Sempra Energy is currently the most active U.S. company in Mexico's gas market. President Fox wants to attract additional foreign investment for exploration and production for the petroleum and natural gas sectors. To help with the process while avoiding Constitutional limitations, PEMEX has come up with a plan to use multiple service contracts. PEMEX wants to draw foreign firms to the Burgos gas field, where it is hoped production can be doubled, thus reducing Mexico's reliance on gas imports. Other projects include the Cantarell gas field and upgrades to the country's refineries. Unveiling multiple service contracts could have significant potential to change how the company raises capital. Bidding on the multiple service contracts could start in the fall of 2002 and the value could reach $8 billion. About 70 companies are said to be interested in participating in the bidding, including ChevronTexaco Corp., Royal Dutch/Shell Group, BP PLC, Schlumberger Ltd., and Halliburton Co. Compensation could take one or more of several forms. Winning firms could either be reimbursed for operational costs tied with commercial production, invested capital plus interest, or be guaranteed a certain percent of profit for commercial production. The profit percentage would be competitively set. Companies will not be allowed a stake in any discoveries. The opening for multiple service contracts comes out of Article 6 of the 1958 Oil Law which grants PEMEX the right to hire contractors to improve operational efficiency, provided they do not receive an interest in production. The plans carry some degree of political risk, as the idea of foreign hydrocarbons companies operating in Mexico could bruise national pride, given the continued popularity of Mexican ownership of the country's oil and natural gas resources. Furthermore, there is a chance Fox's plan for using multiple service contracts might be ruled unconstitutional by the Supreme Court, which has stood against Fox on previous attempts at changing the status quo in the energy sector. Potential participants in the bidding for multiple service contracts can look to the examples of Iran and Venezuela as test cases for the use of multiple service contracts; in neither case has the concept worked particularly well, due to the difficulty in attracting and retaining companies. In Venezuela, some of the companies involved did not adequately assess the risks and are unhappy with the agreements they struck, while in Iran, participants had to repeatedly renegotiate their deals until the rate of return was almost doubled. Foreign companies already perform various services for PEMEX such as drilling and construction of storage facilities, but combining these services under one contract would save money and improve efficiency. The proposed contracts would last 10 to 20 years. Coal provides only about four percent of Mexico's total energy requirements. The majority of the country's coal reserves, which are low quality due to their high ash content, are located in Coahuila. Mission Energy, a U.S. company which purchased the previously government-owned Minera Carbonifera Rio Escondido (MICARE) when it was privatized, is now the largest producer. Mission Energy's production comes from the Sabinas and Fuentes-Rio Escondido basins in Coahuila estado. Operations there are comprised of two open pits and three underground mines with reserves of 208.5 million tons. Mexico's other major coal producer is Minerales Monclova (Mimosa), a subsidiary of Mexican steel company Grupo Acerero del Norte. Micare was privatized in 1992 and Mimosa was spun off as a separate entity. Mimosa produces coking coal in five underground mines in the region of Sabinas. Domestic supplies are augmented by a small volume of imports from the United States, Canada, and Colombia. Both hard coal and brown coal are consumed in Mexico. Hard coal is used by coke ovens in industrial operations, while consumption of brown coal is devoted entirely to electricity generation. An historical summary of coal production and consumption in Mexico is shown in Table 7. There are no major river systems in Mexico. The Sierra Madre mountain chains that run the length of Mexico separate the country into Pacific and Atlantic watersheds; instead, because of the relatively short distances between the mountains and the oceans, there are many relatively short-length rivers that flow west to the Pacific Ocean or east to the Gulf of Mexico. The longest river in Mexico is the Rio Grande (known in Mexico as the Rio Bravo), which forms part of Mexico's northern border with the United States. The longest river wholly within Mexico is the Santiago (which incorporates the Lerma River as its upper section), in south-central Mexico, which flows first northward, then westward to the Pacific. 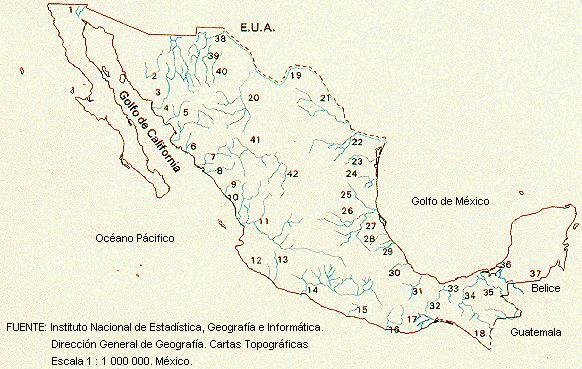 A map of Mexico's river systems is shown in Figure 2. Historically, Mexico has derived much of its power from hydroelectric facilities. Many small, extremely outdated hydroelectric power plants are still operating in remote areas of the country, some of which date back to the 1920s. Hydroelectric plants presently account for more than 10,000 megawatts (MWe) of electric generation capacity, or about one-fourth of the total generation capacity in Mexico. However, a severe droughts in parts of Mexico in the past few years have significantly curtailed hydroelectric power generation. The drought of summer 2000 took 900 MWe of hydroelectric capacity in northeast Mexico offline and forced the CFE to depend on hydroelectric facilities in the southeast where water levels allowed normal hydroelectric operations. As of June 2002, dry conditions in Sinaloa and Sonora states in northeast Mexico were threatening to force a cut in hydroelectric generation there, affecting about 20% of electric generation in the region. The largest hydroelectric power plant in Mexico, in terms of generating capacity, is the 1,500 MWe Manuel Moreno Torres facility (also known as the Chicoasen Power Plant), which is located in Chiapas estado in far southern Mexico. Mexico has five hydroelectric facilities that are 900 MWe or larger and 18 that are at least 100 MWe in capacity. All are owned and operated by CFE. A summary of Mexico's largest hydroelectric power plants is shown in Table 8. In addition to these plants, CFE and Mexico's second-largest electricity producer, Luz y Fuerza Centro (LFC), operate 15 plants in the 20 to 60 MWe range, for an additional 685 MWe of capacity, and 37 plants under 20 MWe, for another 285 MWe. The only privately-owned hydroelectric facility is the 6 MWe El Plantanal station, operated by SKF Sverige AB. CFE estimates Mexico's total hydroelectric potential at about 42,000 MWe. However, Mexico has not exhibited a policy promoting large-scale expansion of hydroelectric power like many of its Latin American neighbors. Because of the relative arid conditions over much of the northern part of the country, there are relatively few sites suitable for new hydroelectric development. Also, environmental concerns and the need to relocate rural communities stand in the way of greater utilization of the country's water resources for hydroelectric energy. Projects to harness the Usumacinta River and other waterways have been cancelled due to opposition from local groups. One such project was the El Caracol power plant on the Balsas River, where a doubling of the facility's 609 MWe capacity had been planned. CFE has adjusted to opposition by working with local communities before construction to win support. The company has been offering to build needed infrastructure like roads and schools in exchange for local backing of the project. In September 2002, the company will break ground on the El Cajón hydroelectric facility in Nayarit estado and the La Parota hydroelectric facility in Guerrero estado. The El Cajón plant is scheduled to cost $650 million and have a capacity of 680 MWe, which would make it the sixth-largest power plant in Mexico. CFE is also considering new projects in Oaxaca and Chiapas estados. Hydroelectric plants capable of generating an additional more than 2,500 MWe are in the planning or construction phases, including a $115 million expansion of the Manuel Moreno Torres hydroelectric plant by France's Alstom Power that will add more than 900 MWe in electricity generating capacity. Site work is scheduled to begin in early 2001 and the plant will begin operations in April 2004. A summary of the largest hydroelectric power plants currently in planning and construction stages is shown in Table 9. Mexico has an estimated geothermal electricity potential of at least 8,000 MWe, second in the world only to Indonesia. Mexico's first and largest geothermal power plant is the Cerro Prieto facility, near Mexicali in Baja California, whose first unit was completed in the 1970s and has since been expanded to include four units producing a total of 820 MWe. A summary of Mexico's geothermal power plants is shown in Table 10. In addition, CFE is planning or constructing new units at the Los Azufres and Los Humeros plants and building new plants at El Chino, Maritaro, and La Primavera. These new facilities, shown in Table 11, will add more than 300 MWe to Mexico's total geothermal generating capacity. Even after these are completed and brought online, only about 15% of Mexico's known geothermal potential will have been exploited. In particular, a band of geothermal fields across the middle of Mexico, in Mexico's volcano region, has the potential for producing large amounts of power. (Many of the potential geothermal energy sites are in close proximity to volcanoes.) A map of Mexico's geothermal zones is shown in Figure 3. Current capacity from wind power in Mexico stands at 2.1 MWe, but wind farms so far have been limited to smaller projects. In 1994 the New World Power Corporation initiated operation of the La Venta wind farm, where 7 Vestas V27-225 wind turbines generate up to 1.575 MWe, which is sold to CFE. In April 2002, Fuerza Eolica, a joint venture between Enron Wind and Grupo Fuerza, won a contract to build a 30 MWe wind farm at La Ventosa, in Oaxaca estado. Fuerza Eolica has also submitted proposals to CFE for approval for four more wind farms -- a 30 MWe wind farm at Cozumel in Quintana Roo estado and projects with capacities of 5 MWe, 60 MWe, and 300 MWe in Baja California estado. The renewable energies subsidiary of Spain's electric company, Iberdrola, is interested in building wind farms in Mexico as well as Brazil. The company plans to invest $4 million between the two countries. In March 1998, the U.S. Initiative on Joint Implementation selected a project aimed at building a hybrid system to utilize solar, wind, and diesel capacity in San Juanico, Baja California Sur. The project involves Arizona Public Service Company, Niagara Mohawk Corporation, and CFE. There have been no commercial projects in Mexico for generating electricity from solar power. Mexico's agriculture department has invested $6.2 million in solar-powered pumping systems for livestock and irrigation. Laguna Verde, located at Alto Lucero in Veracruz estado, is Mexico's lone nuclear power plant. The facility consists of two units, each rated at 674 MWe. Ebasco Services Inc. designed and built the plant for CFE, and the units were completed in 1990 and 1995, respectively. The reactors were manufactured by General Electric, and generate subcritical steam at a temperature of 283 degrees Celsius and a pressure of 958 pounds per square inch. Mitsubishi Heavy Industries TC4F turbines capture the energy from the steam for generation. The plant uses a once-through salt water cooling system. In November 2001, CFE reiterated its position that it is not planning any new nuclear plants in Mexico. Mexico contains an estimated 17,600 miles of crude oil pipelines, 6,300 miles of petroleum products pipelines, and 875 miles of petrochemical pipelines. The ports of Cayo Arcos, Dos Bocas, and Pajaritos on the Gulf handle most of PEMEX's oil exports. A diagram of Mexico's oil pipeline system is shown in Figure 4. About 20 miles of pipeline needed to bring crude from the oil fields in southeastern Mexico to Ciudad Madero refinery (which may be later extended to the Cadereyta refinery) have yet to be completed. PEMEX has been bogged down since 1999 in disputes with local farmers over right-of-way for the unfinished pipeline. Recent legal changes have given landowners rights which have made the negotiating process more difficult and time-consuming, and it is not known when this matter will be resolved. PEMEX has also completed a 620-mile pipeline to supply the Cadereyta refinery in Querétaro estado with crude oil from Nuevo Teapa, Veracruz. Oil was scheduled to begin flowing in May 2002. Construction was handled by a subsidiary of South Korean engineering firm Sun Kyung Engineering Corp.
Mexico has about 8,283 miles of natural gas pipelines, which are centralized in two main belt systems: one in the north running from Chihuahua estado to Matamoros on the Gulf at the U.S. border, and one in the south extending from Guadalajara to Tabasco. A diagram of Mexico's natural gas pipeline system is shown in Figure 5. There are 10 natural gas pipelines that cross the U.S.-Mexico border with more on the way; the volume of natural gas carried through those pipelines has more than doubled between 1999 and 2001, to 140 bcf. About 30% of U.S. gas exports pass through the Samalayuca pipeline (completed in 1997) which crosses the U.S.-Mexican border east of El Paso, Texas, and supplies natural gas from West Texas to the Samalayuca I and II power plants near Ciudad Juarez, Mexico, as well as other markets in northern Mexico. Slightly less than half (22 miles) of this 24-inch pipeline is in the United States, with the other 23 miles in Mexico. The pipelines that run from the United States into Mexico have a combined capacity of 1,970 mmcf/d (as of January 2001). The interconnections include the Mexicali (connected with California), Naco (connected with Arizona), Coral Mexico, Piedras Negras, Reynosa, Samalayuca, Ciudad Juarez, and Arguelles pipelines; the latter six of these are connected with Texas. One-third of U.S. natural gas bound for Mexico travels through the Coral Mexico pipeline, which crosses the border near McAllen, Texas. The 300 MMcf/d line, completed in October 2000, supplies a PEMEX facility near Reynosa, Mexico with gas from south Texas. Okemah Construction, Inc. built the $50 million, 104-mile pipeline. Coral Mexico Pipeline LLC owns and operates the U.S. portion, while PEMEX owns and operates the Mexican operation. The pipeline is designed to transport gas in both directions, though currently gas is flowing in one direction only, from southwest Texas to the PEMEX facility. The North Baja pipeline, scheduled to become operational in late 2002 or 2003, will become the biggest transporter of gas imports into Mexico. The $230 million, 212-mile pipeline will carry upwards of 500 MMcf/d to supply southern California and northern Mexico from sources in Arizona. The line will begin near Ehrenburg, Arizona, enter into Mexico near Los Algodones, cross Baja California, and tie into Sempra's recently completed pipeline at Rosarito, south of Tijuana. PG&E, Sempra Energy, and Mexico’s Proxima Gas SA de CV are building the pipeline. PG&E will build the 80-mile U.S. portion and Sempra Energy will oversee construction of the 135 miles in Mexico. A Sempra Energy International-built pipeline supplies a power plant in Rosarito, Baja California. The 23-mile pipeline has a capacity of 300 MMcf/d and began operating in April 2000. The pipeline, which runs from Naco, Arizona, will have a capacity of 130 MMcf/d when the eastern branch is completed in 2003; the western section of the pipeline was completed in 2001. The pipeline is intended to provide natural gas to power plants in Hermosillo and Agua Prieta. Tidelands Oil and Gas Corp. is currently constructing a multi-use pipeline from Eagle Pass, Texas, to Piedras Negras in Coahuila estado. The 6-mile, bi-directional pipeline will carry natural gas, propane, and butane, and is scheduled for completion in November 2002. Tidelands is also considering constructing a 30-inch, 500 MMcf/d natural gas pipeline from El Paso into northern Mexico. Within Mexico, the 127-mile Gasoducto del Bajio gas pipeline was completed in 2001. This $55 million project will supply industrial and residential consumers in the states of Guanajuato and Aguascalientes, where the transported gas ends up in a distribution system run by Gas Natural de Mexico, a unit of Spain's Gas Natural. The 16- and 12-inch pipeline originates in Salamanca, goes to Leon, and then onto Aguascalientes. Gaz de France completed the project, originally begun by TransCanada. In October 1997, the CRE granted a 30-year permit for a consortium of private companies to transport natural gas to the Yucatan Peninsula. The permit went to Energia Mayakan, a joint venture of Mexican firm Gutsa Construcciones, TransCanada Pipeline, and Bechtel subsidiary Intergen. The consortium will invest $276 million to build the 450-mile pipeline, which will transport gas from the petrochemical complex at Ciudad PEMEX in Tabasco estado to the Mérida III power plant (and other plants slated for conversion to natural gas) in the Yucatán. In February 1998, the CRE approved permits for two other gas pipelines, both of which are to run from Palmillas to Toluca, but over different routes. The pipelines are to be built by Tejas Gas and Transnevado Gas (a subsidiary of the Nova Company of Canada). A gas pipeline from Cuidad PEMEX in southern Mexico to Escuintla, Guatamala, has been proposed with private money. The 347-mile, $450 million pipeline is scheduled for completion in 2004 and will carry 100 mmcf/d of natural gas to utility and industrial customers. The pipeline will run parallel to an existing oil pipeline and could be extended as far as Panama, while also supplying gas to Costa Rica, El Salvador, Nicaragua, and Honduras. Cost of running the pipeline to Panama is estimated to be an additional $850 million. Mexico has a unified electric grid that serves 97% of the population. Mexico's energy grid can be divided into four sections: Northern, North Baja, South Baja, and Southern. The Northern section of the grid is connected to the U.S. at the Eagle Pass, Texas – Piedras, Mexico border. The connection uses an asynchronous technique that handles the problem of differences in current between Mexico and the United States. Other trans-border lines are scheduled, including one from a power station outside Phoenix, Arizona to Sonora, Mexico. Another is being planned between Tucson, Arizona, and northern Mexico. The national electric grid, operated by CFE, maintains over 20,000 miles of transmission lines (400, 230, 161, and 150 kilovolt) and over 336,442 miles of sub-transmission and distribution lines (138, 115, 85, 69, 44, 34.5, 23, 13.8, and 6.6 kilovolt). Mexico uses three-phase current (60 cycle), 127 volts for residential and commercial use, and 220 volts for industrial applications. The interconnected system is adequate for Mexico's present needs, but requires significant investment to eliminate losses and enable expansion. CFE has initiated a program to make needed improvements to the national electric grid. A consortium of ABB, Spain's Isolux, and Mexico's Techint won a $250 million contract to improve electrical transmission in Mexico, especially in Tamaulipas and San Luis Potosí estados in northeast Mexico. ABB received $80 million to build a 750-kilometer (466-mile) high voltage power transmission system under this contract. The overall scope of the project includes five power lines with related equipment and four substations linked using fiber optics to control the equipment. Completion is scheduled before the end of 2002. A proposed $400 million transmission project that would run from the Public Service Company of New Mexico's Palo Verde nuclear plant in Phoenix, Arizona, into Mexico is awaiting US Department of Energy approval, with a decision on the 300-mile project expected by the end of 2002. If approved, construction would begin in 2004. The governments of Mexico and Guatemala are discussing the Plan Puebla Panama, a plan to develop trans-border electrical transmission lines between the two countries. Construction of generation plants is also part of the discussion. Mexico is heavily dependent on fossil fuel for its electricity generating needs. Mexico's electricity consumption has rapidly increased, up by about 60% in just the past decade, and fossil fuel generation has been increased by nearly 60% to keep up with the demand. An historical summary of electricity generation and consumption in Mexico is shown in Table 12. Forecasts place the average demand growth for electricity in Mexico at 4.9% per year until 2003, when it is expected to climb to 6-7% annually for the next decade; demand should grow even faster in industrialized areas. Some regions of the country will also see a greater demand -- the northeast and the Yucatan Peninsula should see demand grow 6.8% per year while annual demand growth for Baja California, where as many as five LNG regasification terminals are planned, is expected to hit 8-9%. The Fox Administration has called for the gradual phase out of consumer subsidies for electricity over the next 10 years. The proposal would save the government $1.1 billion in 2002. In 2001, consumer subsidies cost taxpayers $6.8 billion. Analysts at Bear Stearns predict the cut in subsidies would drive consumer electricity bills up 83%. There has been only a moderate increase in Mexico's electricity generating capacity over the past decade. As a result, there is now the possibility of a power shortfall, worsened by the addition of 800,000 new customers per year, that could result in blackouts as early as 2004. However, a large amount of new generating capacity is in the planning and construction stages. CFE wants to build 27 power plants by 2005 to increase generating capacity by nearly 11,000 MWe, at a cost of about $6.6 billion. CFE officials are also calling for a total of $59 billion in investments in the electricity sector to bring nearly 36,000 MWe online by 2009, with half of that amount to come from private sources through Build, Lease and Transfer and Independent Power Production (IPP) projects. An historical summary of installed electricity generating capacity in Mexico is shown in Table 13. Under Mexico's energy policy, a significant percentage of Mexico's conventional thermal-electric power plants are slated for conversion to natural gas by 2005. Most of these are now coal-fueled and oil-fueled. Presently, heavy fuel oil is by far the predominant fossil fuel used in Mexico for power generation. A summary of technologies and fuels used for power generation in Mexico, as of the beginning of 2001, is shown in Table 14. Like PEMEX in the oil and gas industry, CFE for years has enjoyed a monopoly in the electric power sector, although reforms instituted in 1992 allow for IPP and cogeneration facilities to sell it power. CFE owns most of Mexico's installed electric generating capacity (including all the nuclear and geothermal generating capacity) and generates 92% of the country's electricity. LFC is Mexico's other state-owned electric utility, with about 2% of the generating capacity, primarily around Mexico City. PEMEX also generates electricity (about 3% of the total as of the end of 2001); various private sector IPP and cogeneration generating facilities produce the rest. CFE's dominance is beginning to wane slightly as the company lacks the funds needed to meet Mexico's soaring electricity demand. IPPs are now beginning to secure a significant market share; by the end of 2003, a Spanish-owned IPP, Iberdrola, expects to have more than 2,000 MWe online, and will pass LFC as Mexico's second-greatest electricity generator. A summary of Mexico's electricity generating companies, as of the beginning of 2001, is shown in Table 15. Presently there are more than 40 thermal-electric power plants in Mexico that are greater than 100 MWe generating capacity, including six that are over 1,000 MWe. The largest capacity thermal-electric power plant in the country is the 2,100 MWe Petecalco Power Plant in Guerrero estado, which has recently converted from oil to imported coal as its fuel. Two other large coal-fueled power plants, Carbon II and José Lopez Portillo, are just south of the U.S. border in Mexico's main coal-producing area, in Coahuila estado. Since 1968, Mexico has installed numerous gas turbine power plants throughout the country. These plants, fueled by natural gas, distillate, or diesel oil, contribute more than 3,800 MWe of generating capacity to the Mexican electricity system. Most are owned and operated by CFE, but LFC, PEMEX, Altos Hornos de Mexico, and several other industrial companies also own gas turbine power plants to produce electricity for their own consumption or for sale to CFE. Oil-fired gas turbines are more numerous than natural gas-fired turbines, but Mexican energy policy in the near-future clearly involves converting some of these to utilize natural gas as primary fuel. Mexico's most modern fossil-fuel power plants use combined cycle gas turbine technology for increased efficiency. Mexico currently has more than 4,000 MWe of combined cycle generating capacity, nearly all of which is natural gas-fueled. The largest of these is Iberdrola's 750 MWe three-unit Monterrey facility, with a fourth 250 MWe module scheduled to come online before the end of 2002. There is presently one other combined cycle power plant greater than 700 MWe in capacity, the $647 million 717 MWe Samalayuca II power plant in Chihuahua estado, which was built by a group of U.S. and Mexican companies (including General Electric Power Systems, General Electric Capital Services, El Paso Energy Corporation, and Grupo Ica of Mexico) under a build-lease-transfer framework partly financed by loans from the Inter-American Development Bank and the U.S. Export-Import Bank, and utilizes natural gas imported via pipeline from the United States. CFE is operating this facility under a 20-year lease-to-own arrangement. Most of Mexico's combined cycle power plants are owned by CFE, but IPP companies have recently begun operations at several new generating facilities, selling their contracted electricity back to CFE. The largest of these new IPP facilities are the Iberdrola Monterrey complex and the 600 MWe Bajío power plant in Guanajuato estado. The Bajío facility is owned by Energía Azteca (a Mexican joint venture of Intergen and AEP); the project included construction of a feeder gas pipeline connecting to the PEMEX pipeline and a wastewater treatment facility that recycles cooling water to the power plant and also provides a supply of irrigation water for local farmers. A summary of Mexico's thermal-electric power plants is shown in Table 16. There are also many small diesel or internal combustion electricity generators which operate in mostly remote regions of Mexico. These plants, most of which are owned by CFE, supply a total of about 200 MWe of localized electricity for isolated industries and communities. Another form of small power production -- cogeneration of combined heat and power (CHP) -- is also being utilized in Mexico. Cogeneration has actually been available to industries and IPPs for about a decade, but there has been only a relatively small amount of investment in CHP facilities because CFE would only buy no more than 20 MWe of excess power capacity from any CHP facility, and would only pay the marginal cost for the electricity. Cogenerated electricity is still not yet deregulated -- any electricity so generated must be directly and captively used by the industrial facility or else sold to CFE; it cannot be sold to remote consumers via the grid. Mexico's largest cogeneration facilities are included in Table 16; a summary of the smaller cogeneration facilities is shown in Table 17. Other power plants will also eventually be needed to keep up with Mexico's burgeoning demand for electricity, but for private companies to win concessions in Mexico, they must meet the CFE criteria of providing the lowest cost for delivered energy. While this criteria greatly benefits Mexico and its power price, it is often difficult for purely private firms to achieve viable rates of return on Mexican power plant investments. Some companies that are partially subsidized by their government, such as Electricité de France (one-third owned by the French government), clearly have a distinct advantage over purely private entities. These firms are not only willing to accept lower rates of return, but have access to government credits for project financing. Despite the obstacles, AES won the first independent power project bid circulated by the CRE in February 1997. That project involved the construction of the 532 MWe Mérida III plant, located in the capital city of Yucatán estado. To date, the government has approved licenses for 12 IPPs worth $3 billion. It is hoped that by 2004 the generating capacity of these IPPs will be 6,000 MWe. Ten of the 12 IPPs are located in northern Mexico, five of which are entirely dependent on U.S. gas; the other five are dependent to some degree on U.S. exports of natural gas. Other power companies, from other countries, have also been actively pursuing projects in Mexico. In early 2001, the Mexican government awarded a $192 million contract to Canada's TransAlta to build and operate a 259 MWe gas-fired power plant in Chihuahua estado. This is the second contract for TransAlta in as many years; in 2000, the Calgary-based company won a contract to build and operate as 252 MWe plant in Campeche estado. Spain's Iberdrola signed a contract to build a 1,036 MWe combined-cycle power plant near Altamira in Tamaulipas estado. The project will contain two 518 MWe units, which the company hopes to have operational in 2003. PEMEX will supply the plant with natural gas. Iberdrola is also considering building a 100-mile pipeline to import gas from the United States. Mexico's current relatively less-stringent environmental regulations is one of the factors that have provided an incentive for U.S. companies to locate their power plants in Mexico to produce electricity for export to California. Sempra Energy Resources has plans to complete a 600 MWe power plant near Mexicali on the Baja Peninsula by mid-2003. The $350 million plant will be built near the North Baja pipeline, is scheduled to become operational in 2003, and will be connected to the U.S. electricity grid via a 230 kilovolt transmission line. Upon receipt of the proper import and export licenses, Sempra plans to export electricity from the plant to California. InterGen is also planning to build a power plant in Baja California estado. The proposed 765 MWe project, to be located near Mexicali, calls for half of the electrical output of the plant to be shipped to California. A summary of the largest thermal-electric power plants currently in planning and construction stages is shown in Table 18. Tractebel's Monterrey CHP facility will also produce 235 metric tons per hour of steam, which be sold to a glass manufacturer, Vitro. Tractebel has agreements to sell electricity from the project to nearby industries, but might run afoul of Mexico's laws that prohibit sale of electricity from CHP facilities to anyone but CFE. There are also plans for additional cogeneration facilities in Mexico. Dupont plans to build a new self-sufficient electric plant in Altamira, Tamaulipas; electricity from the plant will supply Dupont's pigment manufacturing plant in Altamira, and any excess power will be sold to CFE. A summary of Mexico's planned capacity additions by technology, as of the beginning of 2001, is shown in Table 19. Environmental consciousness is growing in Mexico and the government has taken steps to better manage its natural resources and protect the environment. Mexico also has introduced a federal tax incentive program for purchase of pollution control equipment, and has reformed its General Law of Ecological Equilibrium and Environmental Protection (LGEEPA). Changing LGEEPA necessitated reorganization of the various ministries responsible for environmental and natural resource issues. It is now the task of the Ministry of Environment, Natural Resources, and Fisheries to modernize and centralize Mexico's federal environmental policy and enforcement. The National Institute of Ecology is responsible for executing environmental policy; the Federal Attorney General for Environmental Protection carries out environmental inspections and negotiates compliance agreements with businesses and industrial groups in Mexico. Responsibility for chemical substances and hazardous wastes is held by the Ministry of Communications and Transportation, while the Ministry of Energy deals with nuclear power and waste issues. Mexico is moving in the direction of vehicle emission controls. Mexico City has some of the worst air pollution in the world, and in recognition of this problem Mexico has put together a $1.4 billion program to combat air pollution, which includes tax incentives for pollution control technologies and assistance from the World Bank and other international lenders for sulfur reduction at the Tula refinery. PEMEX began removing lead from its gasoline in 1990 with the introduction of a high-octane unleaded gasoline. Since January 1, 1998, all gasoline sold in Mexico has been lead free. In the major cities of Mexico City, Monterrey, and Guadalajara PEMEX sells much cleaner, reformulated gasoline, which is blended with oxygenated additives such as MTBE. Efforts have also been made to clean up Mexican diesel fuel; PEMEX began selling a low-sulfur diesel fuel in 1993 that had a 0.05% sulfur content and an aromatic content of 30%. This formulation is now standard throughout the country. Carbon emissions from the consumption and flaring of fossil fuels in Mexico in 1999 were approximately 100 million metric tons. An historical summary of carbon dioxide (CO2) emissions from fossil fuel use in Mexico is shown in Table 20. Demographic and industrial growth trends have placed extreme pressure on Mexico's ecological systems. These trends have exacerbated the deterioration of air, water, and soil quality in most regions of the country. Mexico City hosts 50% of the country's total industrial production, and special characteristics of the Mexico Valley airshed have exacerbated the problems associated with urban and industrial concentration in this area. Some estimates place the population of Mexico City and immediate surrounding areas at 20 million, which makes it one of the largest population concentrations in the world. Twenty of the country's 40 river basins receive 90% of Mexican discharges, with only a small fraction effectively treated. Over 95% of Mexico's solid and hazardous waste is dumped in unregistered, unsecured dump sites, affecting water and soil quality. In addition to domestic air quality targets established in response to serious pollution problems, Mexico has international environmental obligations under the North American Agreement for Environmental Cooperation (NAAEC), a NAFTA side agreement. Mexico participates with its NAFTA partners in the North American Commission for Environmental Cooperation (NACEC) and is pursuing infrastructure projects along the U.S.-Mexico border. Priority border projects being developed and financed by the North American Development Bank and the Border Environment Cooperation Commission (BECC) address wastewater treatment, drinking water, and municipal solid waste. In June 2002, NACEC issued a report calling for provisions for NOx emissions trading to address climate change as the electricity markets of Canada, the United States, and Mexico move towards greater integration. The report, "Environmental Challenges and Opportunities of the Evolving North American Electricity Market," acknowledges economic benefits and greater reliability through cross-border shipments of electricity and calls for more attention to be paid to safety and environmental issues. Recommendations include greater public access to information about power plant pollution emissions, facility siting, and differences in environmental standards across the three countries; cooperation in assessing the environmental impacts on air, ground, and air quality due to long-distance transportation of air pollution; and a framework for carbon, sulfur dioxide, and nitrogen dioxide trading. The report also addressed greenhouse gases, calling for the NAFTA members to put carbon reduction programs into action. An 1889 convention establishing the International Boundary Commission, reconstituted by the Water Treaty of 1944 as the International Boundary and Water Commission, United States and Mexico (IBWC). The IBWC divides the use of international waters, builds and operates water conservation and flood control projects, and constructs and maintains boundary markers on the land boundary and on international bridges. In recent years, the IBWC has worked to resolve long-standing border sanitation problems, to monitor the quantity and quality of border groundwaters, and to address water delivery and sedimentation problems of the Colorado River. A series of agreements on border health (since 1942); wildlife and migratory birds (since 1936); national parks, forests, marine, and atmospheric resources. The 1983 La Paz Agreement to protect and improve the border environment and Border XXI, a binational, interagency planning program, begun in 1996, to address environmental, natural resource, and environmental health concerns in the border area by identifying and addressing long-term objectives and goals into the 21st century. Mexico receives international assistance for its environmental programs, primarily from the World Bank, Japan, and the United States. Major activities include programs covering emission standards development, pollution research support for the Instituto Mexicano del Petroleo and other institutions, and loans for new, clean taxis and small buses. Mexico also receives assistance for the National Center for Environmental Research and Training (which disseminates information on air pollution and studies industrial hazardous wastes) as well as programs for desulfurizing crude oil at the Tula de Allende refinery, environmental infrastructure development, and strengthening northern border region environmental planning and administration at the federal, state, and local levels. In March 1998, the Interamerican Development Bank (IDB) loaned Mexico $23.4 million for work on overcoming barriers to the commercialization of energy efficiency. Despite cooperation with the U.S. and other countries and international agencies, Mexico has had repeated and serious problems enforcing environmental legislation. Ineffective administration, poor communication, and corruption have hindered the good intentions of environmental reform. In December 1993 Mexico passed a new foreign investment law which promotes competetiveness and established clear rules for the entry of international capital into productive activities. CRE was created in October 1995 to regulate the privatization process in electricity and natural gas, as well as to monitor competition in opened sectors. International companies (especially from the United States) are expected to play a major role in bringing online the 12-13 GWe of new generating capacity which CFE says it will need by 2006. The Mexican Energy Minister stated in early March 1998 that Mexico would require investment of $12 to $15 billion over the next five years for new electric generating capacity. In November 1997, CFE announced rate hikes for 1998 of 6.2% in real terms as part of a policy aimed at removing subsidies to power consumers. The CRE has been busy defining natural gas distribution zones to be opened to private investment, and conducting the bidding process for distribution permits. In 1996, a consortium formed by U.S. firms Enova and Pacific Enterprises and Mexico's Proxima was granted the first natural gas concession awarded in Mexico, to deliver natural gas in the Mexicali, Baja California area. In March 1997, the same consortium was granted a permit to distribute natural gas in the Chihuahua-Anahuac-Delicias areas. In April 1997, Compania Nacional de Gas, S.A. (Conagas) was awarded a permit to distribute natural gas in the Piedras Negras region of the northern state of Coahuila. Concessions for gas distribution in Monterrey, the country's third-largest city and most important industrial center, have been granted to the Mexican subsidiary of Spain's Repsol and Compania Mexicana de Gas. The two companies invested nearly $220 million, including $180 million to purchase the city's existing gas system from CFE. In 1997, Repsol won another concession, to distribute gas in Toluca, a rapidly growing industrial city west of Mexico City. In all, about 30 cities are planning to install natural gas distribution systems. During 1998, CRE oversaw bidding on gas distribution permits for four of Mexico's largest regions: Mexico City, Texcoco, Monterrey, and Northern Tamaulipas. The opening of the energy sector was also aided by the restructuring of PEMEX in 1992, when four independently operating divisions were created: PEMEX exploration and production, PEMEX Gas and Basic Petrochemical, PEMEX Refining, and PEMEX Petrochemical (secondary petrochemicals). Mexico, unlike other countries, makes a distinction between basic and secondary petrochemicals, because the production of basic petrochemicals is reserved to the state by the Constitution, and is the responsibility of PEMEX. In order to broaden the scope of private sector investment in the sector, the government reduced the number of basic petrochemicals by reclassifying a number of them. Since 1986, the government has reduced the list from fifty substances to eight. Mexico was the United States' second-ranked trading partner in 2000, accounting for 10% of U.S. trade. In 2000, $123.2 billion in merchandise exports to Mexico surpassed U.S. exports to Japan, even though the Mexican economy is just one-seventh the size of Japan's. The United States was Mexico's predominant trading partner, accounting for 82% of Mexican exports and 70% of Mexican imports. The chief U.S. exports to Mexico were motor vehicle parts, electronic equipment, and agricultural products; the top imports from Mexico included petroleum, motor vehicles, and electronic equipment. Implemented in January 1994, NAFTA has liberalized Mexico's trade with the United States and Canada. The agreement will eliminate all tariffs on trade between the three countries by the year 2010. NAFTA also eliminates, as far as possible, non-tariff barriers and promotes safeguards for intellectual property rights-patents, copyrights, and trademarks. The pact also includes provisions on trade rules and dispute settlement, and a parallel labor agreement seeks to ensure full protection of workers' rights. Through its supplemental environmental cooperation agreement, NAFTA marked the first time in the history of U.S. trade policy that environmental concerns have been addressed in a comprehensive trade agreement. The pact also serves as a basis for enhancing ongoing U.S.-Mexico cooperation on a host of other issues that do not respect national borders. NAFTA has been a boon to U.S.-Mexico trade. U.S. exports to Mexico have climbed from $41.6 billion in 1993 (the year prior to NAFTA), to $87 billion by 1999. Similarly, Mexican exports to the U.S. soared from $40.7 billion to $110 billion over the same period. In early April 1998, the Interstate Natural Gas Association of America urged the U.S. Trade Representative to accept Mexico's overtures for speeding up the phaseout of the current 5% tariff on imported natural gas from the United States in exchange for U.S. tariff concessions on imports of Mexican chemicals. Specifically, Mexico wanted a faster phaseout of the U.S. import tariff on purified terephthalic acid (PTA), which is currently 8.9% plus $18 per ton. Natural gas producers and marketers in southern Texas are eager to get into the growing northern Mexican gas market. NAFTA set Mexico's tariff on imported natural gas at 10% beginning in 1993, with an annual 1% reduction for 10 years through 2002. As trade tariffs are eliminated and more and more segments of the Mexican energy sector become privatized, the U.S.-Mexican border is becoming increasingly ambiguous to gas and electricity infrastructure in the two countries. Several new electricity lines connecting the grids of the two countries are being discussed, and gas pipelines crossing the border are becoming more numerous. The future energy and trade policies of both Mexico and the U.S. will need to reflect this growing interdependence. In early 1998, the Mexican Secretary of Commerce and Development was investigating accelerating the elimination of customs duties on, among other commodities, crude oil, natural gas, propane, butane, ethylene, propylene, butadiene, and paraffin. In May of 1999, a 4% tariff on imported natural gas was eliminated, easing the financial burden on companies piping natural gas over the border. CFE has been invited to join an electric power pool in Texas (the Electric Reliability Council of Texas, or ERCOT) in a move that could eventually lead to increased electricity trade between Texas and fast-growing northern Mexico. Importing power from the United States will allow Mexico to invest capital in transmission and distribution. Currently, ERCOT has only limited electricity import or export capacity between Texas and Mexico, but there is interest in expanding the capacity due to forecasts of strong Mexican power demand growth. Mexico's participation in NAFTA has already contributed to a substantial improvement to the country's economy; Mexico's NAFTA membership helped the Mexican economy grow by 2.3% per year between 1994 and 1999. Following the December 1994 devaluation of the peso, Mexico had experienced a severe financial crisis that also threatened the stability of other emerging market economies, especially in Latin America. The United States responded by leading a group of international lenders in making available to Mexico over $40 billion in international financial assistance, including $20 billion from the United States. This action helped stabilize the Mexican economy, allowing Mexico to repay the loans to the United States more than three years ahead of schedule. The 1995 peso crisis created runaway inflation for several years but inflation has now been brought back under control and in 2003 is expected to be at its lowest level in more than a decade. Signs point towards an improving Mexican economy after the country experienced negative GDP growth in 2001. The economy, which grew an average of 4.3% between 1997 and 2001, should be buoyed by an economic rebound in the United States, higher domestic demand, and rising oil prices. Economic growth for 2002 is expected to come in around 2%, slightly higher than the official target of 1.7%, and growth in 2003 looks even better, due to a brighter export scenario. The fundamentals of Mexico's economy are healthy -- inflation, interest rates, and unemployment are low, the deficit is manageable, and capital reserves are solid. An historic summary of some of Mexico's macroeconomic indicators is shown in Table 21. Fiscal discipline also has helped raise Mexico's standing with the international financial community. Several rating agencies have upgraded Mexico's long-term foreign denominated debt from BB+ to investment grade BBB. Mexico's standing has also been aided by greater integration with the U.S. economy and astute management of economic policy. On the down side, however, Mexico still has not addressed meaningful tax reform, and Mexico has a higher tax-to-GDP ratio than other countries in the same rating class. Mexico has been a major market for U.S. petroleum equipment and services, and the continued opening of the energy sector should only increase opportunities. This market includes exploration, drilling, and production equipment and services for both onshore and offshore operations. It also includes specialized pipe laying and subsea diving equipment. Newer fields lack a transportation infrastructure, as the country's highway system is not well-enough developed. Recent environmental laws and agreements make pollution controls another strong U.S. export prospect. Mexico is seeking to improve energy efficiency and clean pollution, especially in the Mexico City and northern border regions. Opportunities exist for the employment of all kinds of remediation technology as well expanded use of high-efficiency products. Market opportunities in Mexico will be available to firms that offer flexible solutions to specific environmental problems, and that have access to relatively low-cost financing. Generally, the fastest growing markets are expected to be in water pollution control and solid and hazardous waste. Demand for environmental technologies in Mexico should also be driven by potential cost savings and plant and equipment modernization, which will grant Mexico-based firms opportunities to become more efficient and to comply with environmental laws and regulations. The ongoing privatization of state-owned enterprises will increase the demand for site-assessment and remediation services and will provide additional capital that can be used to invest in environmental projects. Investment opportunities also exist for petrochemical production technologies and associated infrastructure. Mexico has several features making it a good location for petrochemical production. The country has huge hydrocarbon resources, ranking among the world's leaders. The Mexican government has promoted the chemical and petrochemical industries as opportunities requiring large amounts of imports and investment. Also, heavy dependence on export markets for Mexican chemical and petrochemical products to bring in hard currency has left a weakened domestic supply for Mexican production of more advanced products. Frequent blackouts are testament to the need for improved generation, transmission, and maintenance technology in the electricity sector. The country has placed a renewed emphasis on natural gas, necessitating rapid expansion of the natural gas infrastructure. Converting power plants to natural gas operation will require specialized equipment and experience.